Many students have individual needs or circumstances that prohibit them from attending school full time. 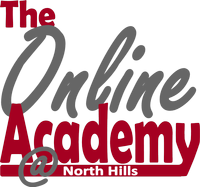 As such, the Online Academy @ North Hills provides a fully online program. Online Academy students are held to the same high standards set in the regular classroom. In addition, students are assigned a guidance counselor who will assist them with course selection and career planning. Coursework is available for students to begin and complete the entire middle school and high school experience online. Online Academy students who reside in the North Hills School District enjoy access to the same resources as traditional students. They may attend athletic and social events, compete in athletics, and participate in the more than 50 clubs and activities offered at the middle and high schools. As official North Hills students, Online Academy students receive a North Hills School District diploma and participate in commencement ceremonies. Students who reside in a school district other than North Hills, enjoy the same benefits and opportunities offered by their home school district.